<Hard to say what's the deal here, but the old Metronidazole plus a reliable antibiotic (such as Kanaplex) approach would be a good first step. My Texas Chiclid has recently developed some white spots on his skin and fins. It looks like a fungus but I don't know for sure. Can you please identify what it is and what course of treatment I should use. <Looks like Lymphocystis... are you able to use the search tool on WWM? I have a Texas Cichlid who is deliberately ramming itself into objects in the tank. It has already dived so hard into the top of the tanks lid and cut the top of its head. It's acting like it's crazy. It's been laying on its side and floating around in circles especially through the air bubbles. When I look at the behavior it almost appears that it has vertigo or as if its trying to kill itself. I have tested to water several times to ensure the Ph level is right and that there's no high ammonia levels. It's becoming emotional because I've had it a long time and am at a loss of what to do next. I was told by my fish store that if he's lying on it's side it could be bloat and have removed the carbon from the tank and gave it antibiotics for the past week. I have 4 other fish who appear to be acting normal. Have you ever seen or heard of anything like this? Any information you could provide would be greatly appreciated. It bangs objects in the tank so hard that it actually wakes me up at night. I have attached a picture of the fish so you can see the damage it's doing to itself. Please help! 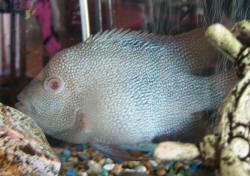 and the Texas cichlid who is ill. They've shared this tank for the past 4 years and the tank is very established. I will be doing a partial water change today and putting the carbon back in the tank. All of my levels are right on point and I just can't explain the change in behavior. I just read another article where a woman had this to say and my fish is acting the same way. 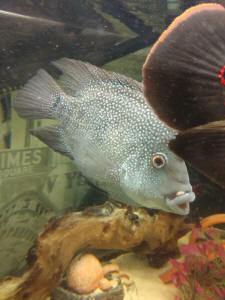 "A couple days later, today, I noticed my blue cichlid was shaking /vibrating like when he gets mad, and then he stopped and starting darting around the tank. It stopped, but then a few hours later, he went insane and swam full speed, very hard at the top hood of the tank and literally knocked the hood up into the air and half off the side of the tank; this scared me. Immediately after doing this, he swam hard face first into the glass of the tank and then into the divider screen. I notice now, he keeps going to the top of the water and sticking his head up out of the water, like as if he's trying to get out! I feel so bad, I love my fish and I have had him for 2 yrs now so there is no reason he should be acting like this..."
I was on this site: http://www.cichlidfish.com/post116012.html when I found someone with similar concerns. I don't know how sound the advice she was given was. 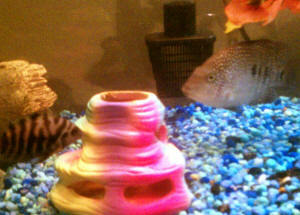 My fish doesn't seem to be harming the other fish but my concern is can disease develop from the open wound he has. I have added additional salt to the tank and will do so again once a do another partial water change. I've never seen anything like this before. I have a 30 gal tank I can put him in for now, but I guess it still doesn't explain what's going on. 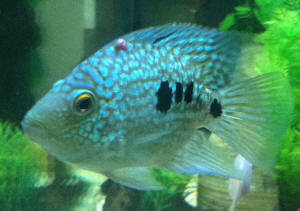 I have a juvenile Texas cichlid who has been with me for around 6 months now ... Goes along with all the other fish.. Since yesterday I have noticed a small lump on both his sides where the fin starts.. The lump on one side is bigger than the other and looks like it's an open sore.. I am worried..could you pls let me know what this is.. I am attaching a pic for a clearer understanding.. I purchased a male and female Herichthys cyanoguttatus yesterday. I had their tank ready with bogwood and a large piece of slate rock to form a cave. They have plain sand as a substrate. 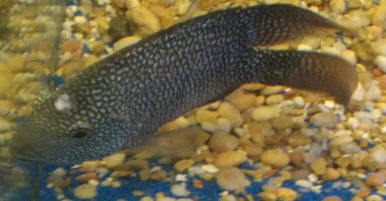 The Female is swimming around, exploring, looking very happy. The Male however is just resting his under-belly on the sand and seems to have rapid gill movement. The filter is established, the water is fresh and treated with Prime before being added. He did swim a little but seemed quite slow and almost verging on a bit clumsy. I am so worried and would really appreciate any help. <Are you quite sure he's a male? And/or that the female is a girl? In terms of size, personality, fin length and colour they're basically identical. My existing tank has Texas Cichlids I know they are not compatible with plants. I saw on your site about letting your fish have a summer vacation. Living in southern CA, would the Tex's survive in a pond year round. I have a friend who has a small one. Okay great! Thanks for the help, do you know any good websites about the Texas that I can figure male and female difference? My Texas cichlid has not been well for about a month. At a guess he is about 8 years old. He started getting sores on his side which I treated with Melafix and they cleared up. 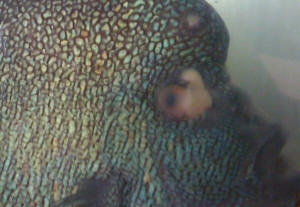 I changed his medication to aquari-cycline and he developed more lumps between his bottom fins. I then tried treating him with para-cide and after 2 weeks he still has sores and tumors which are appearing at the base of his fins, his body is bloated. He is still eating, his energy levels are a little lacking and is gasping. I am about to start treating him for fluke and tapeworms. 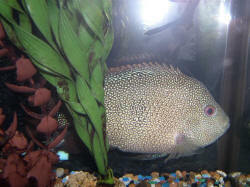 Hi I'm from Australia an I have a very large 35cm Texas cichlid who has an eye disease. I have been treating with Flagyl a very strong human antibiotic [penicillin] for the past 5 days. Hello! I recently introduced an adult female Texas (about 6" ) into my 120 gallon established tank with many Honduran Red points and an adult male Texas (about 8-9"). I set up a divider to keep them separated while he got used to her being in the tank and she got used to him as well. I had holes in the divider that were big enough for all the HRP's to fit through and even big enough for the female Texas to fit through but not big enough for the male to fit through. So after about 2 weeks the female Texas was returning fin slapping/lip locking with the male through the divider and finally decided to go over to the same side he was on. They paired up! (I didn't think they would even get along, let alone pair up). The whole tank is quite peaceful, a little "gill flare" here and there from the HRPs to each other, but no big aggression issues. third time, same thing. Second night something happens and the next morning she is hiding and he is pacing the tank. Now I know that sometimes the male Texas can become overly protective of the eggs and see the female as a threat, but I figured he would chase her away and protect the eggs, but it's as if he forgets all about the eggs and just focuses 100% on chasing her around. This is only the third time they have laid eggs and I know it takes some time to get things right, but Im not sure they will ever get it right. Should I intervene and after she has laid the eggs separate the male to the other side of the tank while she watches the eggs, or should I separate her to the other side and let him watch the eggs, I don't think he will watch them. Or should I just let them keep going through this cycle hoping that eventually they will figure things out together? 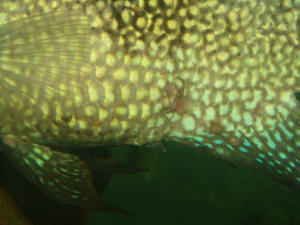 < It is true that when Central American cichlids spawn it takes a few times to get it right. It is very difficult to pair up adult cichlids. Re: TX Cichlid missing most of tail now. Texas Cichlid With Missing Tail -- 07/26/07 Chuck, With treating in soft water, is it sufficient that our tap water has a water softener or do I need to add some sort of salt to the tank water? <Ions like calcium and magnesium found in hard water tend to interfere with some antibiotics like Tetracycline. Simply replacing the calcium and magnesium with sodium like found in a water softener really doesn't do any good.> Also, can I start using Nitrofurazone now or do I need to wait until the treatment of the tetracycline is done? 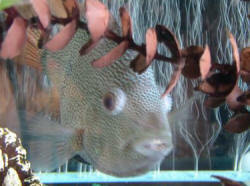 <If the fish is getting better then complete the Tetracycline treatment. If there is no progress then do a %50 water change and start to treat with the Nitrofurazone.> If the fish survives and the tail doesn't grow back will he pretty much remain in that vertical position? < Fins help stabilize the fish in the water. I think he may stay in this position without his fins.-Chuck> Thank you so much for your time.